Jim and I spent last weekend in Colorado Springs. We went out for the wedding of the son of one of our college friends. The mom and dad both graduated from Iowa State with us, and Jim was in their wedding and the dad was in our wedding. They wanted us to stay in the five bedroom, three bath house they had rented for the week. At one point there were 14 of us sleeping there, but it worked out just fine. We flew out on Thursday, so Jim was able to go to the bachelor party activities with the guys. I stayed at the house with the older ladies. 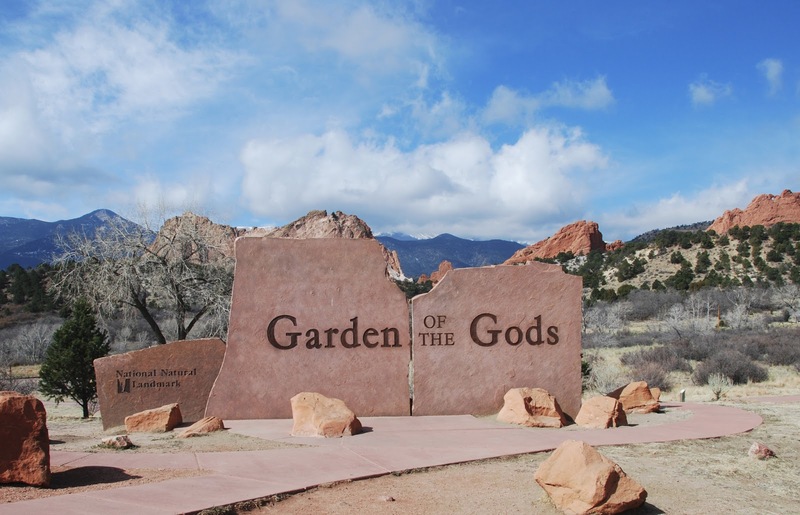 Friday Jim and I went to the Garden of the Gods. We had not been there since before we had kids, and it has changed a bit with the addition of parking lots and paved trails. It was cold and windy, but at least we had a beautiful sky that day. We also went to Manitou Springs to do some sight-seeing and to have lunch. It is a really cool old Victorian town. It began to snow that night, which was the rehearsal dinner. All of the out of town guests were invited, so we took part in that. We had a very fun table at the dinner, and the evening passed quickly. The snow continued through the night and was near blizzard conditions by the next day. Although the accumulation was nothing near the 12.4" that St. Louis got, it still made for some treacherous driving conditions. We all went to the base early to make sure we arrived on time for the wedding. Since the groom graduated from the Air Force Academy, the wedding took place in the Ir Force Chapel, which is a beautiful structure. Despite the weather, the wedding went off without a hitch, and the reception was on the base as well, so we didn't have to travel far to get to it. Everyone at the reception was so friendly, and the DJ was wonderful. We had a lot of fun dancing with everyone. Sunday brought more snow, so we were a little house bound. Finally in the afternoon six of us drove to the Broadmoor Hotel and went to their bar for a martini. It was nice to get out of the house. Monday we helped pack up all the cars and strip all the beds before heading off. Jim and I went to Castle Rock for lunch and sight-seeing before driving to the airport. It was pretty exciting to get an email from TripAdvisor letting me know that I am among the top 1% most-read reviewers of all time. 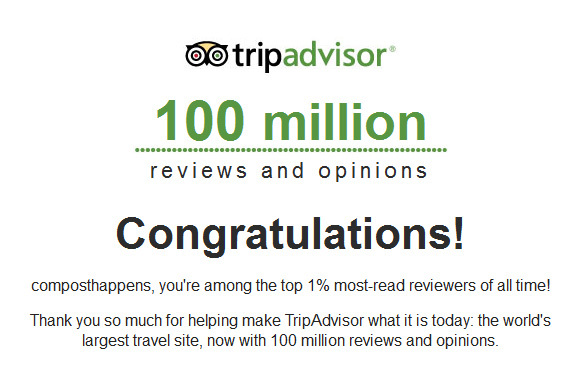 Considering how many people are posting reviews (there are over 100 million reviews on the site! ), it is rewarding to know that folks are taking time to read the reviews that I put up there. I joined TripAdvisor in 2005 because we were getting ready to take a family vacation to Jamaica and I wanted to find a resort that would meet the needs of everyone. What attracted me to the site is the fact that the reviews are posted by ordinary people who are usually quite honest about their experiences. Because the site has been so helpful to me, I have always returned the favor by posting photos and a description of what my experience was like. I know they have taken some flack lately about possible bogus reviews, but personally I think the percentage of people who does that is pretty small. I always discount the exceedingly glowing reviews (unless a good number of people are glowing), and I also discount the one star reviews. In the case of negative reviews, I look really closely at what they are complaining about. If their only complaint is that the towels were not soft enough or some other minor infraction, I can discount their review. I feel that overall you can get a pretty good sense of if the hotel, resort, restaurant or attraction is one that you personally will enjoy. TripAdvisor - don't leave home without it! So cheers to being in the top 1% - I just hope the government doesn't decide to tax me on it, because obviously I am having way too much fun! Since I don't live in a cave, I had of course heard of the show Downton Abbey. Lots of people were tweeting about it and/or discussing it on Facebook. But I had never watched any of the episodes, because I read somewhere that it is a British soap opera. That pretty much killed it for me. Then my husband went to visit his parents when my sister and I headed to Cincinnati over President's weekend. He got caught up in watching the last two episodes of Season 3 with them, and he really enjoyed the show. Since I am always struggling with gift ideas for him, a little light bulb went off in my mind and I picked up the three seasons on DVD for his birthday. So far we have watched all the episodes of Season 1, and I have to admit that I am hooked. The story line is interesting, the sets are amazing and the casting is brilliant. But I was quite confused about the whole "entail" thing. (Which sounds a little too much like entrails for my liking!) So I did what most people do when they are confused about anything - I Googled it. If you need some help following this important part of the story line, I found a great post on Austenprose that succinctly describes the legal issues surrounding the entail of the Downton Abbey estate. I now understand why parts of the family are on different sides of the issue, and can actually sympathize with both points of view. I am eager to continue watching the series to see who ends up on top in this debate. If you haven't seen the show, I recommend taking a look for yourself. It is easy to get caught up in Downton Abbey! For several years I have been seeing advertisements by Family Tree Tours to travel to the country of your ancestors for the purpose of doing genealogical research and also to see the areas where they lived. It seems that the trips are normally to Germany, though I do think they went to Ireland last year. What makes these tours unique is that the tour director will try to line up an English speaking person in the town you want to visit, and will help you get to the town for a visit to hopefully learn about your family. Since I don't speak one lick of German, this would be of great benefit to me. The reason I began to think seriously about going this year is the fact that we have a copy of the travel journal that Elsie Metz kept back in 1912. My Metz family is from the Rhineland Pfalz area of Germany, and that happens to be one of the tours in 2013. As I looked at the map I realized that the last town the tour will be visiting is only a thirty minute drive from Insheim, where my Metz family lived. Additionally one of my Metz cousins has introduced me through Facebook to a Metz relative who still lives in Insheim, so the possibility exists that I could meet her as well. Unfortunately after looking at all of the German ancestors on both my side and Jim's side of the family, the Metz family is the only one from this region of Germany. So I would not be able to try and find any additional families on this trip. As part of the tour price, they will arrange for you to visit up to three ancestral towns so I would lose out there. After reviewing the tour as a whole and all the wonderful places it will be visiting, I decided to go ahead and sign up for the trip. I mailed my deposit off yesterday. I know there are a couple people from the St. Louis Genealogical Society who have also committed to the trip, so I am hoping that we might be able to coordinate our travel plans so that I am not flying that distance alone. But if not, I will survive. What an adventure this will be! I can follow Elsie's lead and keep a travel journal. I will definitely be thinking of her on the trip.